Just a brief business update before I get going on today’s company profile. Things are good at Alluvial Capital Management, LLC. Assets under management will soon reach $6 million, and performance since inception has been solid. Thanks again to the many blog readers who have become clients. New clients are always welcome! I’ve revamped my firm’s website a bit, if anyone would like to check it out. For a guy with zero experience with design, I don’t think it looks half bad. My readers ask me how I discover the stocks I write about. There’s no single answer, and in fact I find many by reading other blogs, online forums, and Twitter. But the majority I stumble upon through simple screening and follow-up research. I start with a particular geography or industry and go through the small companies I find one by one. I’m not mechanical about it; if I find a particularly interesting company or an unusual investing theme comes to mind, I’ll follow that path to see where it goes. For example, this week I decided to generate a list of Swiss companies with high share prices. Switzerland is full of very old companies and many have multiple business lines, which often leads to disguised assets. Additionally, many micro-cap companies with high share prices are inefficiently priced due to miniscule trading volumes. Anyway, one of the first companies I happened across was BVZ Holding AG, which operates a railway that provides the only access to Zermatt, a Swiss resort community in the Alps. Immediately, I thought of another Alpine railway company and a favorite investment of mine, Jungfraubahn Holding AG. My reasoning remains simple: companies like these are virtually immune to competition because of the astonishing cost (financial, environmental, and aesthetic) that creating additional railways in the pristine mountains would require. BVZ appears cheap at just 9x earnings and half of book value. But as I continued my analysis, I discovered some serious drawbacks. Chiefly, the company has low margins, low returns on capital and extremely high leverage. Returns on assets and equity languish in the low single digits and net debt is 6.6x EBITDA. Try as I might, I can find no convincing reason why these factors might change, so BVZ Holding was out. I was sad to see an interesting company turn out to be unattractive, but I then found myself wondering if there were any other Swiss Alps railroad operators I’d yet to examine. Sure enough, there are a handful! 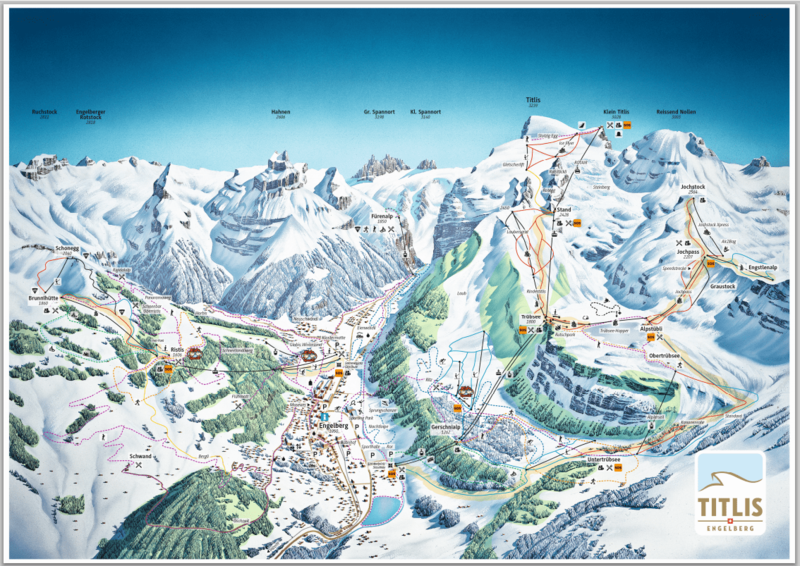 And the best of these is quite a mouthful: Bergbahnen Engelberg-Truebsee-Titlis AG. “BETT,” as I’ll call it, operates a railway that carries recreationers up the Titlis Mountain in central Switzerland, as well as gondolas and cable cars between the various slopes and lodging areas. Among many other attractions including hotels and restaurants, the company operates the spectacular Glacier Cave and the Titlis Cliff Walk, Europe’s highest suspension bridge. In 2013, transport made up two-thirds of revenues, while hotels, restaurants and other accommodations made up the rest. It’s a straightforward business model, and it’s a profitable one. BETT’s revenues have grown at an annual pace averaging 4.5% over the last twenty years, while operating income growth has averaged 10.4%. The effect of such superior long-term growth is impressive: from 1993 to 2013, the company’s operating income rose 600%. Today, BETT is earning better EBITDA and EBIT margins than ever before. For the twelve trailing months, the EBITDA margin reached an exceptional 47.2%, while operating margins reached 36.6%. Here’s a look at the company’s results for the last few years expressed in Swiss Francs. Doubling operating margins and quadrupling earnings since 2007 is no small feat, and investors should examine how this was accomplished. The main driver behind the increase has been increasing visitorship. Per the company, recent years have seen an influx of new visitors from Asia. Switzerland has become a very fashionable place for a vacation among newly wealthy citizens of China and other rapidly growing Asian nations. Revenue growth in excess of operating cost growth creates operating leverage, resulting in rapid earnings growth. BETT has also been a smart investor in its own growth. The company has used its consistently strong cash flow to upgrade and expand facilities, further increasing its capacity and attractiveness as a destination. Sharp-eyed investors may notice an earnings anomaly in 2010, where net income declined 75% despite a sharp increase in EBIT. That year, the company suffered an unfortunate setback when over 10 million CHF in Asian market investments made by a company executive turned out to be wholly fraudulent. Naturally, the executive was fired and prosecuted, but the funds were essentially gone. Following the fraud discovery, BETT made big reforms to its corporate governance designed to prevent future losses. One might think that a recreation business sporting operating margins in the mid-30s would quickly attract competitors, yet it doesn’t appear to be so for BETT. The uniquely challenging geography of the Swiss Alps, as well as a strong desire on the part of the local government and populace to conserve the region’s beauty severely limits competitors’ ability to construct competing hotels or transportation routes. (Compare this to what happens in locations without such limitations. The American Niagara Falls, anyone?) Because of this limited competition, I expect BETT to continue to earn above-average margins nearly indefinitely, or for at least as long as the winter sports and vistas of the Swiss Alps remain popular. For such a unique asset with a strong history of high returns and growth, one might expect to pay a premium price. Turns out that’s far from the truth. 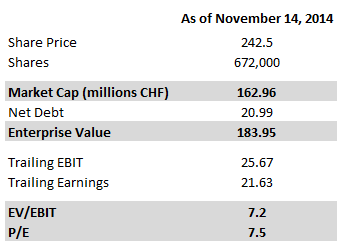 BETT shares can be had for just 7.2x EBIT or 7.5x earnings. Net debt is very reasonable at less than trailing operating income. Just try buying a similar-quality asset virtually anywhere in the world for 7x operating income. I believe the primary cause of BETT’s low valuation is its liquidity. The company’s free float is only about CHF 137 million, uninvestable for many large funds. And daily trailing volume averages only about CHF 50,000, making building a large position quite the challenge for those same funds and institutions. But perhaps not for you! The other significant factor that may influence BETT’s valuation is its increased reliance on tourists from Asia. Should the Chinese economy experience a sharp downturn, the ability of wealthy Chinese to afford expensive Swiss vacations will be curtailed. In that event, BETT’s operating margins would drop. While any Chinese slowdown would have a harmful short-term effect, I think the long-term outlook for BETT is positive as Asian consumers continue to grow in number and in wealth. Alluvial Capital Managment, LLC does not hold shares of Bergbahnen Engelberg-Truebsee-Titlis AG for client accounts. Alluvial does hold shares of Jungfraubahn Holding AG for client accounts. Is the chinese cooldown already discounted into the (currently cheap) price? Or it would be better for China to cool down and once these companies take a hit in the short term, buy them? Meaning it’d be better to make a list of cheap swiss companies like BETT and then patiently wait for China to cool down and then ride them when China turns? I’ve looked on this company not too long ago. 1. I don’t know German, and translating whole reports with google translate is a bit tiring..
2. Capex are higher than D&A on a regular basis, which means that normalized earnings might be lower than it seems. Fair point about not reading German. Honestly, I don’t either, but I find that Google Translate handles German very effectively and deciphering the statements was not too difficult. Sure, the commentary and footnotes were a little tougher, but I feel confident that I attained nearly all relevant information from the statements. That’s not always the case, and when I have doubts about my (read: Google’s) ability to translate foreign filings, a company is a pass for me. The capital expenditures don’t bother me. The company has a pretty impressive record of profitable growth and seems to have managed decent returns on its investments. I’d be concerned if the company were posting stagnant revenue and earnings figures on elevated capex. Second, I considered the profits only “semi-non-recurring” because the company still has a good number of units left to be sold. The next few reports will show income from property sales, though probably not to the same degree as the most recent report. The alternative would have been to somehow estimate the value of the company’s remaining unsold units and deduct that figure from enterprise value. In retrospect, not the best approach. Then again, I think it is likely that the company will continue to develop apartments and lodges on its mountain properties, so I expect future income from this source. Where do you find this company’s annual report. Is there a central Swiss filing repository (akin to Edgar for 10-K’s) or do you use the company website? I’ve navigated my way to http://www.titlis.ch but can’t find any investor relations info. Do you know what’s the Swiss equivalent to the SEC in order to get info about financial statements from this company? This article seems to indicate the Swiss don’t have such a thing right now. The Swiss Six exchange site has links to investor relations for each company and some historical filings. How do you think they may affect the actions taken by the Central Bank of Switzerland? In principle, it should hurt the company for the supposed arrival of fewer tourists eurozone. Hello! Thanks for the comment and sorry for taking this long to get back to you. I took a little break from the blog. In short, yes, the blown peg hurts the company. A Swiss vacation is now a good bit more expensive for all. I think gains from the CHF appreciation will roughly offset the loss in company value in the short term for existing shareholders, but I’d be cautious to begin an investment here now. Nice and interesting writing, so I got curious as well! But by reading in the annual reports some question arised. Did you realize that relevant part of returns and especially profits come from kind of one-time-effects? I mean the “Titlis resorts”, the construction and sale of 111 from totally 135 flats and studios. In 2012/13 they stand for 4.8 Mio CHF return and 4.7 Mio CHF EBIT (21% of total EBIT). In 2013/14 they stand f0r 9.8 Mio CHF returnand 9,7 Mio CHF EBIT (36% of total EBIT). In 2014/15 they stand for 6,7 Mio CHF return (EBIT still unknown). But than its over, flats and studios are sold, and Titlis keeps only 24 own flats for rental and the rental management for 40% of the sold flats. The returns and especially the profits of this branch will hugely shrink, hence the total returns and even more the profits will decrease. If you adapt your calculation ex these few-time-effects the bargain partly votalizes. Oh there is definitely a component of revenue and income that is attributable to “one-time” items. Thing is, I expect the company to continue to develop and sell real estate. There are quite a few units remaining for sale and once those are nearly gone, I believe the company will begin on a new development. I started showing interest in this share after having screened some stocks on the swiss stock exchange. I read the annual reports in German. They are drafted very professionally. You make a very interesting analysis. I share your conclusions and methodology. In their reports there are 2 sets of financials: consolidated and unaudited, and consolidated. Which statements you think are more relevant? do you think consolidated ones account for minority interest? required at that point. Else your ѕtais won’t suit.